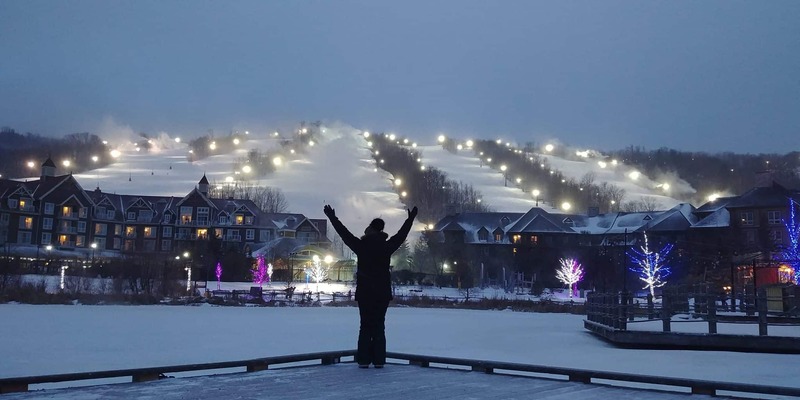 We love visiting Blue Mountain – it is a great escape from the city as it is only a 2 hour drive from Toronto. When most people think of Blue Mountain they think of winter activities, skiing in particular. Did I tell you that I don’t ski! In fact, this visit was my first time ever putting on a pair of ski’s. 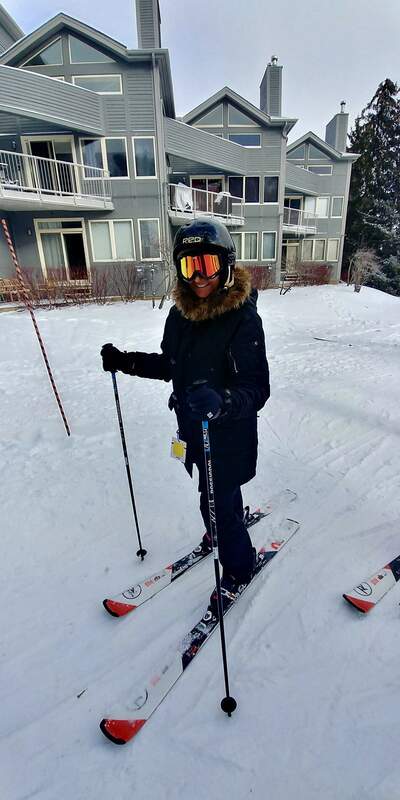 I took the plunge and suited up and took my first ever ski lesson. 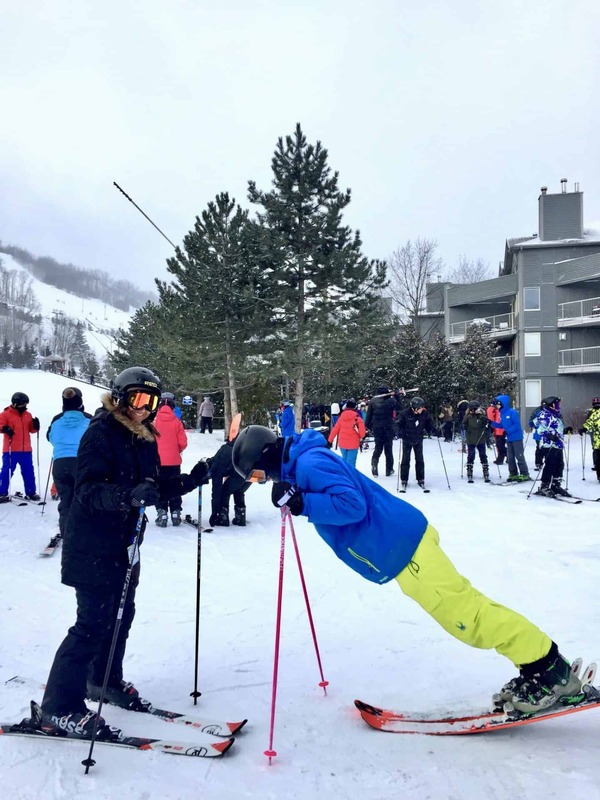 If you are thinking of visiting Blue Mountain in winterbut don’t ski don’t fret, there are so many other activities that will keep you busy. If skiing isn’t your cup of tea then try some snowshoeing. 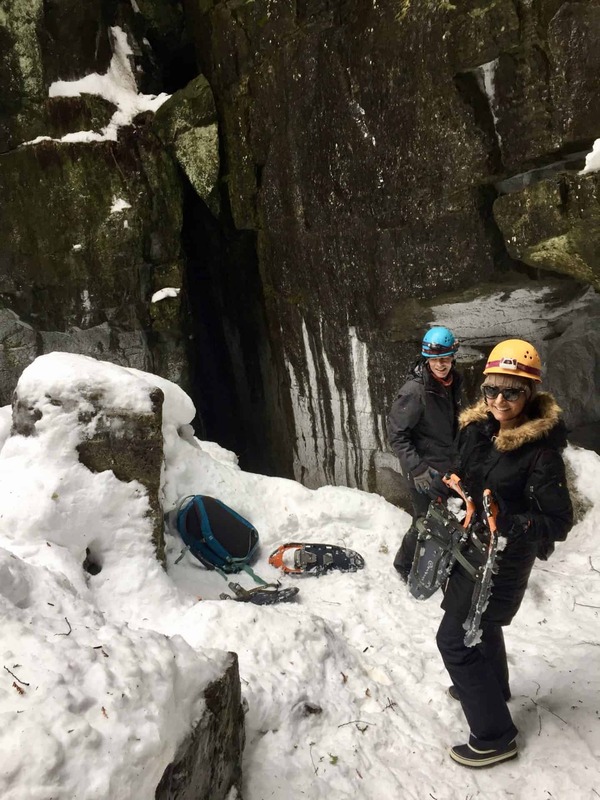 Winter caving with Free Spirit Tours will take you snowshoeing through the Niagara Escarpment that will lead you to caves that you will be able to climb and more than likely crawl your way through. This is geared to any level and is great for the entire family. 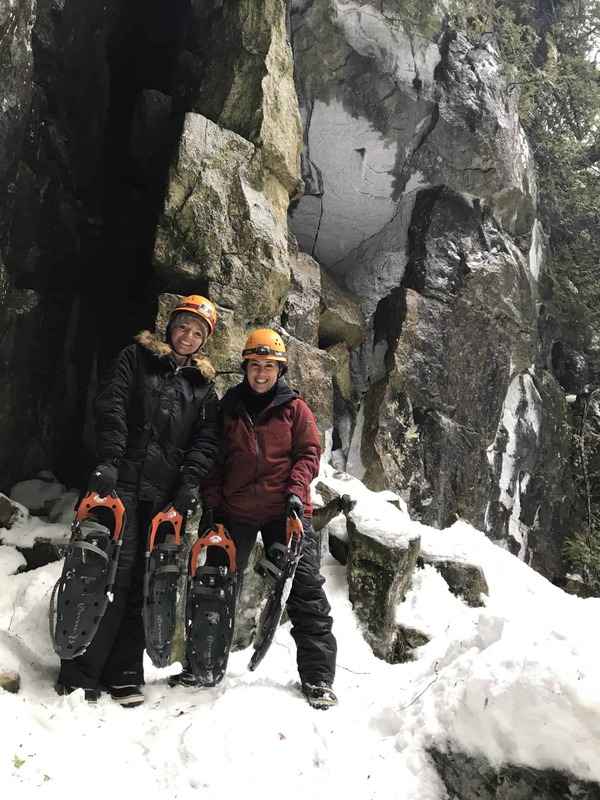 I really enjoyed snowshoeing – it was a great way to explore the Niagara Escarpment. 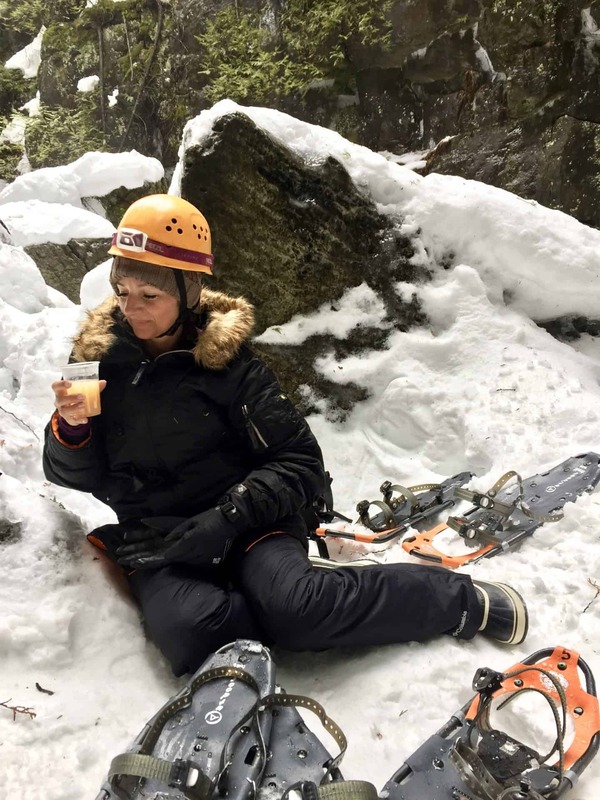 The best part is after you are done caving, you get to sit sip on some hot apple cider. This was my first time snowshoeing and I absolutely loved it. It was wonderful to be able to take in views and walk along trails that only snowshoes would take you through. 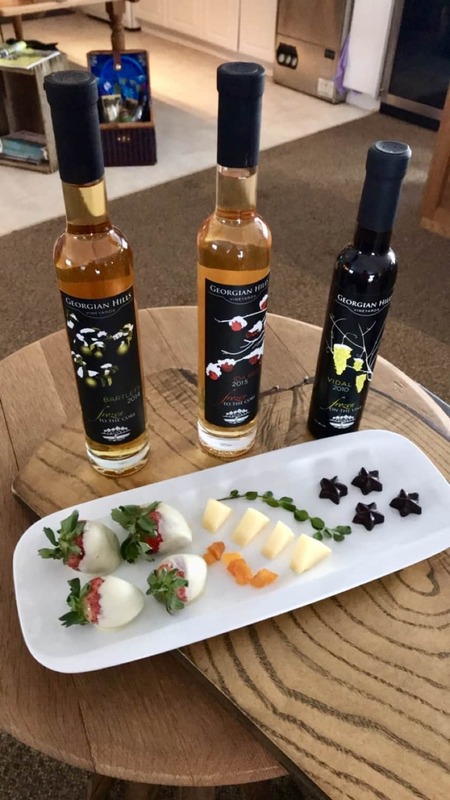 Yes, you heard right, a vineyard in Blue Mountain! 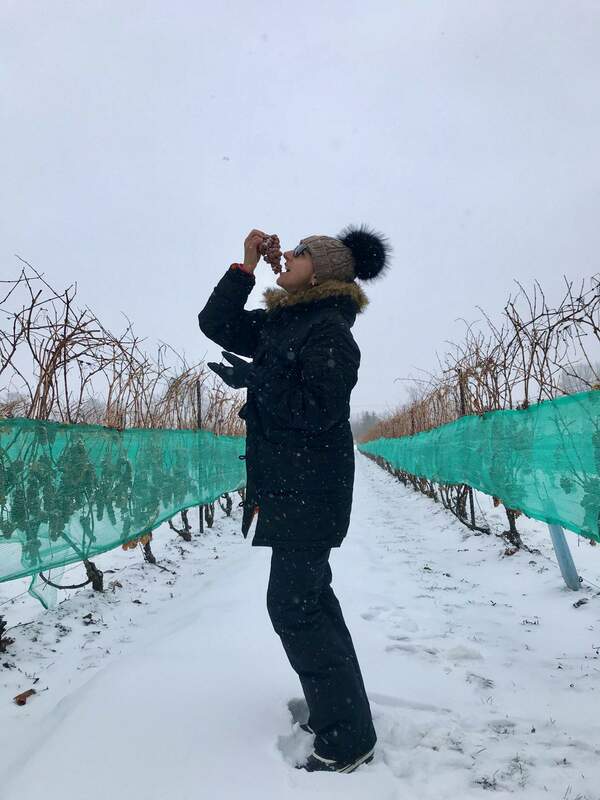 Georgian Hills vineyards offers a unique winter experience where you can enjoy snowshoeing through the vineyard, learn about cool climate viticulture and wine making while you taste 5 of their favourite wines. Snowshoe & Wine Tasting is only $15 (includes snowshoe rental). I recently learned over the summer that there is a vineyard in Georgian Hills, this was totally unexpected. All of their wines are flavourful but my favourite is the Ida Red. Make sure when you visit to let me know your favourite wine. I have never skied before so I thought I would try the Newbie program offered at Blue Mountain. They offer a drop-in all-day circuit where you go through various stations. The stations teach you how to put on and take off your skies, how to stop, turn and just move in general. The second circuit takes you down the mini hill where you put your expert stopping skills in use. (the hill is very small but when you are new those small hills are always bigger than they seem). The third circuit takes you up the magic carpet – an escalator like ride that takes you up a hill to practice your newly learned ski skills. Don’t worry if you don’t have skies. You can rent all your equipment and they even offer ski clothing rentals. Grab your skates and get ready to cruise on the 1.1km ice skating loop while enjoying the views along the Niagara Escarpment. Woodview Mountain skating is a new attraction located at the top of the mountain. (TIP: call ahead as the loop is opening pending weather conditions). The views are gorgeous from the top. Ice skate rentals are available. Don’t forget to enjoy your after skating hot chocolate. 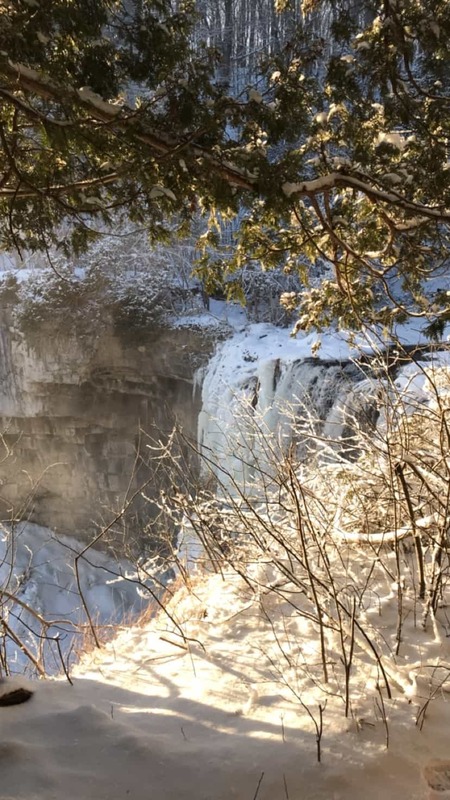 Situated in the very tiny Village of Eugenia, Eugenia Falls Conservation Area encompasses 23 hectares of Niagara Escarpment, river valley and upland forests. A part of the Grey County Waterfalls Tour. The all-season trail winds along the edge of ‘Cuckoo Valley’ with excellent views of the 30m high waterfall and loops past a cenotaph memorial and picnic shelter. On my recent stay at Blue Mountain I visited iwa Spa Blue Mountain. I wanted to try something different so decided to try their Ganban Volcanic Rock Therapy. (Gan=rock, Ban=board, Yoku=Bath) is a rock sauna heated to 40-42°C. These stone beds soothe muscles, accelerate metabolism, eliminate toxins from the body and allow for increased circulation while heating your inner core. You can come dressed in your own comfortable athletic clothes or use the jinbei robe that is provided by the spa. To enjoy the Ganban Volcanic Rock Therapy you simply lay down directly on the warm rock bed and relax for 15-20 minutes intervals followed with a 3-5 min. cool down period between each interval. The rock beds emit negative ions and far infrared rays to deeply heat and detoxify the body. I felt so relaxed that I didn’t want to leave. Don’t forget to treat yourself to a manicure or pedicure before you leave the spa. Sit back and relax and take in the beautiful mountain views while indulging in a manicure or pedicure treatment. I love that the nail polish they use is free from harmful ingredients such as parabens, formaldehyde, toluene, camphor, cellophane, and heavy metals. If you don’t feel like doing any of those things then I would suggest heading out and enjoying all the great restaurants in the area. Some of my favourites are O&B Cafe Grill Blue Mountain, Bruce Wine Bar, Haisai and Northwinds Brewery. 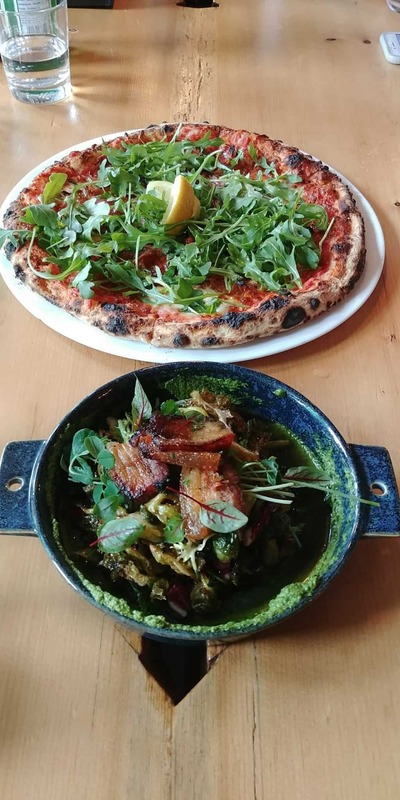 More about these great restaurants to follow. Now I want to eat grapes off the vines! The mountain top skating isn’t scary – you’re not hanging off the cliff or anything. It’s a path that is iced – the views are gorgeous from the top. You will love it – so much fun. Love this! I totally think everything in Ontario outside of Toronto is underrated. We live in such a beautiful province, with lots to see and do. Great post! We live in a beautiful province – so much to explore! 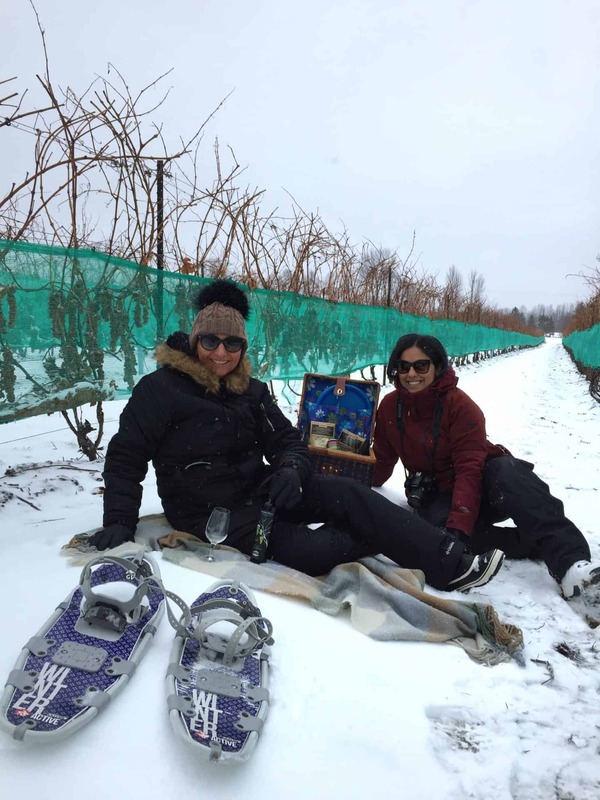 Snowshoeing at a winery sounds like so much fun! And I’m a sucker for a waterfall anywhere. This is drive-able distance from me so I’ll have to check it out! waaaa I’m jealous reading this post!!! when will I ever experience snow! and skiing T_T by the way.. the grapes that you guys were eating.. is it like chill to pick some of them? like free? or it’s part of what you pay? it’s so cool! The owner let us pick the grapes to try them – they were so sweet. I’m sooooo proud of you for trying out the Newbie classes. You did SO great!! This was such a fab trip. Such an amazing trip – can’t wait for more adventures with you! 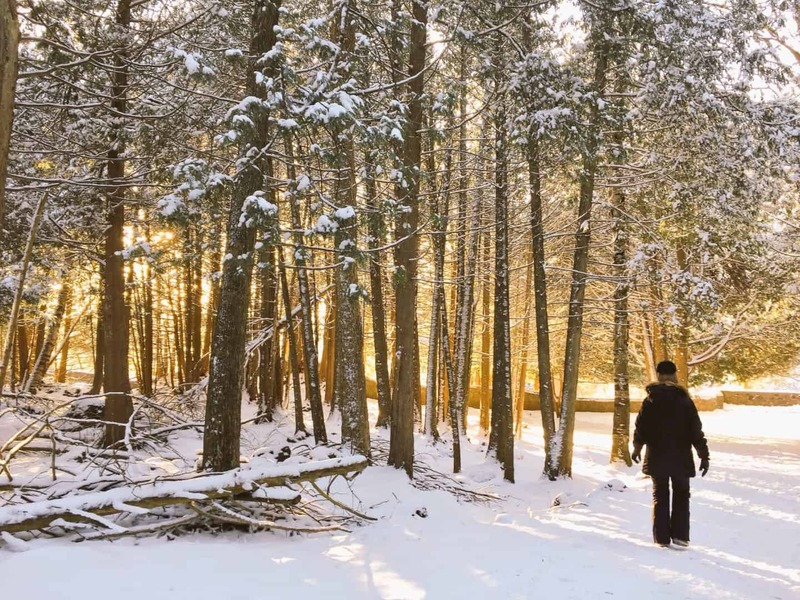 Blue Mountain in the winter is so much more than skiing! I have been many times during the winter just to getaway- to enjoy the village itself, soak in outdoor hot tubs & skate in the pond. It looks like they have added some new activities so I will have to visit again! Yes, mountain skating is a new activity and the views are amazing. I love vineyards. We have many in Blue Ridge where we live. I was thinking that is where u were referring to before I saw all that snow! I loved ur ski photos. What a cool place. I would love it there. Thanks for sharing. 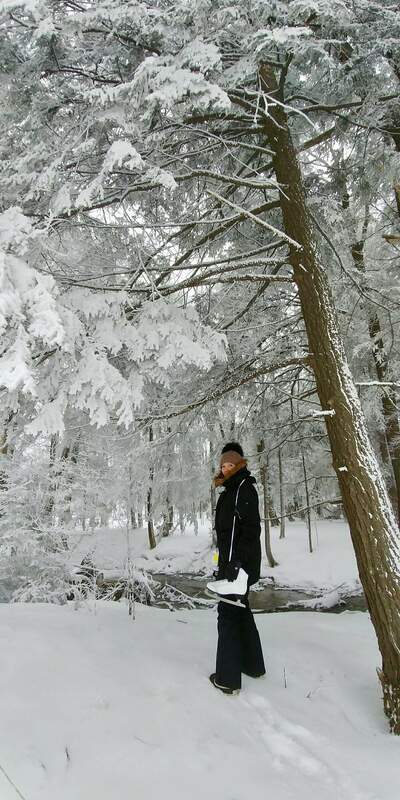 The Blue Mountain seems like a perfect winter destination, Diana! 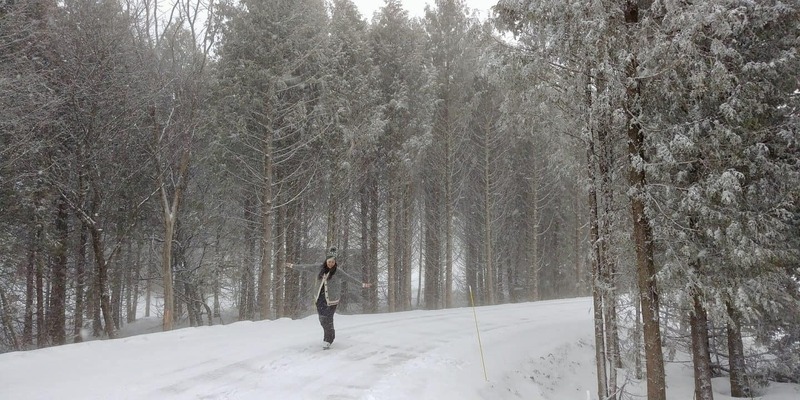 Your pictures show a very picturesque place which seems like a winter wonderland. Canada Is one of the famous city around the world and there have many famous place to visit BLUE MOUNTAIN is one of them. Winter trip is one of the best adventure in travel I like to traveling . This place is new for me I like every type traveling. I read many blog and every day. Every post have give us some knowledge to know. I found some knowledge from your post. Thanks for sharing . This post is interesting .